The planets aligned last week so I was able to spend time in my sewing room making a small quilt that was inspired by Maxine Rosenthal’s book, One Block Wonders. 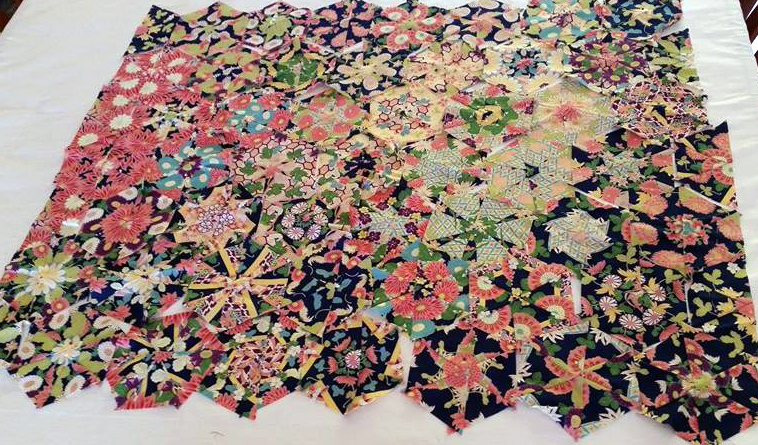 This dazzling quilt is a kaleidoscopic explosion of colour, movement and pattern. 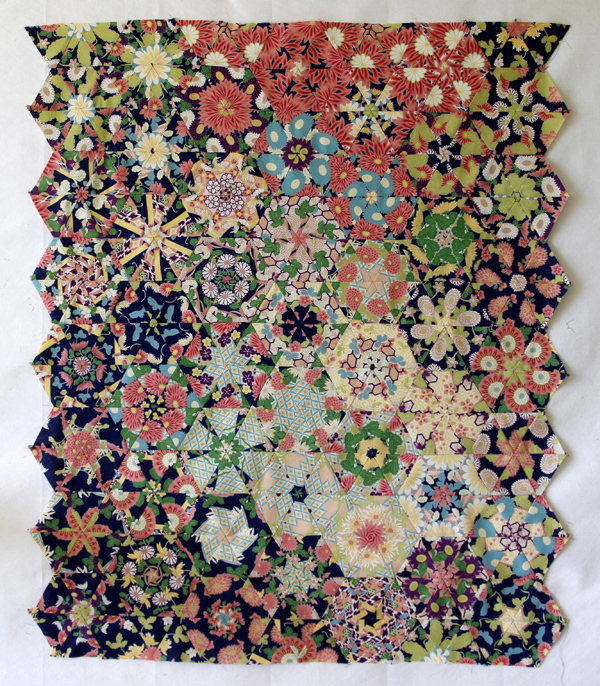 My quilt was cut from just 1.8m (2yds) of fabric (a little extra fabric was needed for the borders). 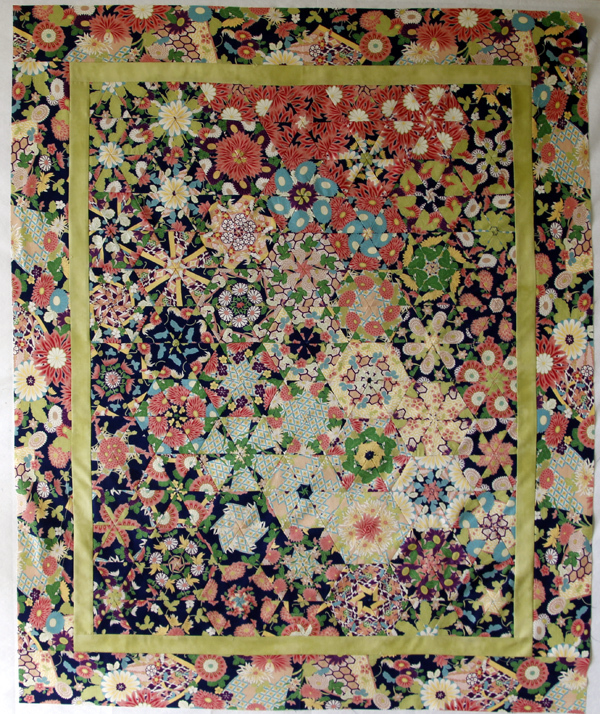 The fabric was a busy print and had a twelve inch pattern repeat. You can see the original fabric in the border. 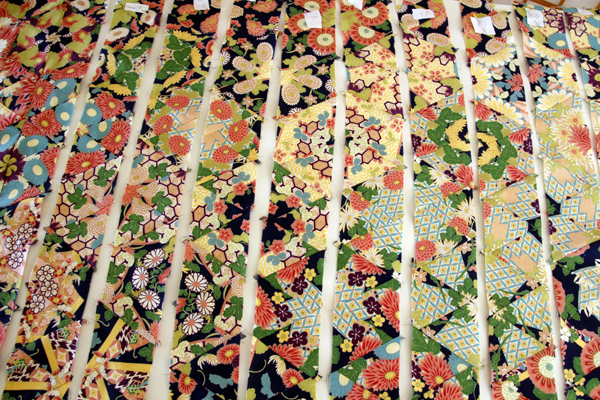 The fabric was cut into six pieces at each twelve-inch pattern repeat. The six pieces were then layered on top of each other and pinned together so that the pattern matched perfectly through all six layers. It was then cut into 3 1/2 inch strips. Using a 60 degree triangle ruler, I cut each strip into triangles. It took less than two hours to cut out the whole quilt. Each six, perfectly matched, triangles became a hexagon block. Each block was then stitched into two halves. Three triangles on each side. The block wasn’t completed at this stage. Sewing the triangles into half-blocks took less than a day. 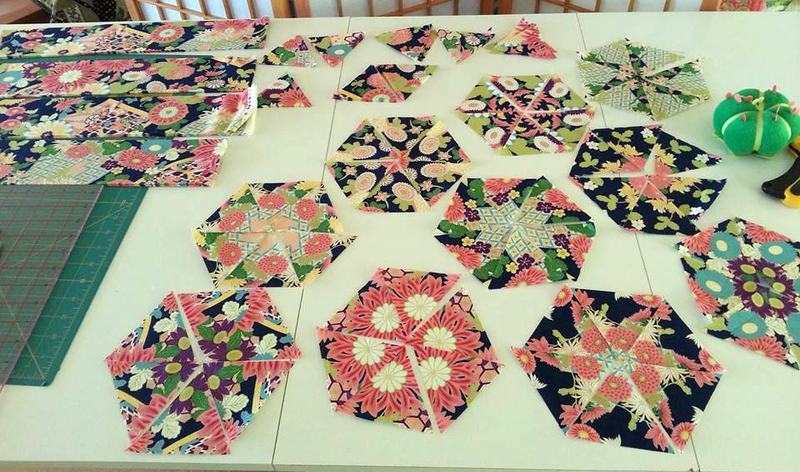 The trickiest part of the whole process was laying out the half-blocks into groups of similar colours and patterns. It was like doing a jigsaw puzzle without the picture to guide you. The tweaking took time. Every time I walked past my design board I would move one or two blocks. Eventually I stopped moving the blocks so I knew it was the best that it could be. It took just one more day to stitch the half-blocks into long strips, join the strips, trim the edges and add the borders. Once the basting was done it was ready for quilting. 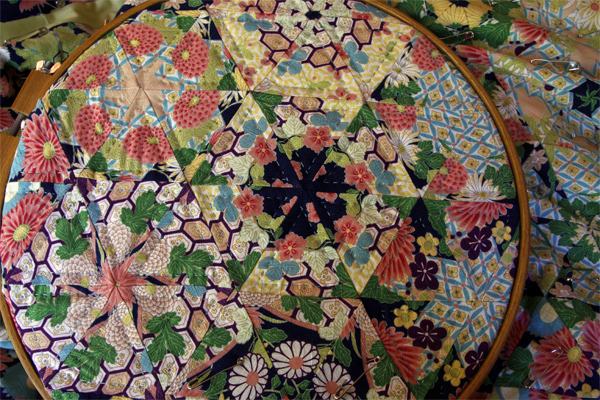 Although this quilt is an ideal candidate for machine quilting, I really wanted to hand quilt it. 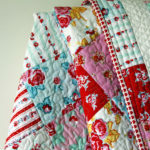 Hand quilting is my passion and sitting with this scrumptious quilt on my lap prolongs my enjoyment. 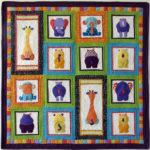 The One Block Wonder quilts punch way above their weight. They look like they have multiple fabrics and are complicated to make, but nothing could be further from the truth. They are so exquisitely quick and simple. An added advantage is that there’s barely any wasted fabric. As the subject says but in reverse…..simply stunning!! Thanks for your comments. 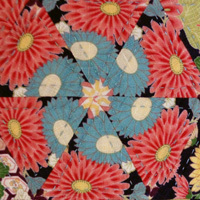 The fabric was Cosmo Textiles-Kimono Floral. I did an online search for you and have found the same fabric but it has a black background. I will email the shop details to you in case you are interested.